Ford's new 250PS Focus ST is set for a starring role alongside a Jaguar XFR in a movie version of The Sweeney to be released in September. First it will desdmonstrates some of the movie stents at the Goodwood Festival of Speed this summer. 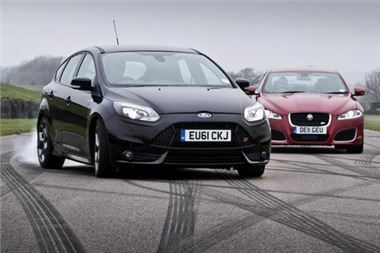 Stunt drivers will take the place of famous Flying Squad detectives Jack Regan and George Carter as their black Ford Focus ST is pitted against a Jaguar XFR up the famous Goodwood hillclimb in an exciting chase sequence to whet the appetite ahead of the movie's release in September. in the grounds of Goodwood House, the Earl of March's ancestral home in West Sussex. In October 2011, special prre-production Ford Focus ST prototypes were secretly delivered to The Sweeney set, joining Ford Mondeos, Galaxys and Transits also being used by the cast as unmarked Flying Squad vehicles. Director and co-writer, Nick Love, whose prior films include 'The Football Factory' and 'The Firm', said: "It was important for me to collaborate with Ford on The Sweeney as their legacy with the original TV show is so strong - they're the perfect partner. I like the Ford Focus ST so much, I want one!" Ford's strong link with the 1970s Sweeney TV series saw Regan, Carter and their Flying Squad colleagues using a string of Ford Granada, Consul GT and Cortina models to make the streets of London a safer place. Production Companies Vertigo and Embargo Films, used six Ford Focus ST models during filming. Set in modern day Britain, The Sweeney stars Ray Winstone as Jack Regan and Ben Drew (aka Plan B) as George Carter and also features Hayley Atwell (from Captain America), Damian Lewis (Homeland), Steven Mackintosh (Underworld: The Rise of the Lycans) and Paul Anderson (The Firm). The Sweeney will be released in the UK in September.